I have written extensively about celebrating the holidays in an enjoyable way - without restriction. You can read my updated blog post here, about socializing here, and my latest article here. Those who have followed me for a while, you know my tips. You need to eat. Seriously. Eat before you go. Eat the foods you love when you're there. Take leftovers home for later. And of course, do not skip meals. You can catch that info in the above posts I linked to. But today, something else has been on my mind. 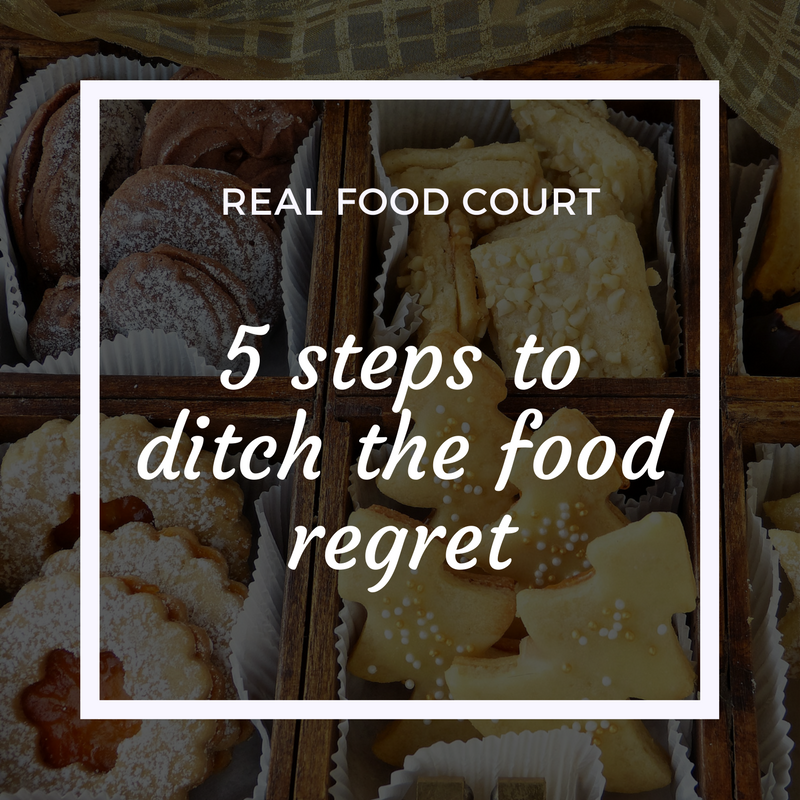 What happens when despite your best efforts you find yourself with food regret? If you have felt it before you know exactly what I mean when I say food regret. It can feel like that feeling in the pit of your stomach like you did something terrible. It can feel as bad as waking up after a regretful night of drinking, or the feeling you get when you tell a white lie, or treat a loved one badly. It is dread. It is despair. But it's just about food. When have you felt food regret? Is it when you practiced all of the best pre-event tips yet still found yourself overeating? Is it after that third cookie because your stomach is aching? Is it that second slice of pizza, or any pizza at all, because you felt too sluggish to get to the gym as planned? I have been there. Again, and again. If it wasn't drinking too much, it was eating too much while drinking, or feeling so full I couldn't stand, or hating that I let myself enjoy sweets at an event, or dessert when I wasn't hungry, and so on. I had so much food regret in college. Looking back I wish I could tell myself it doesn't matter. All of the negative self talk and solution searching just didn't need to happen. I would have been just fine. I am just fine. Diet culture makes us feel guilty for eating past comfort or indulging in dessert. It has taught us that we should be punished for being 'bad'. It tells us that we are the issue and the reason we can't stick to our diet. But, it is just food. We aren't the issue. The real issue is the unfair and unrealistic restrictions or expectations that we put on ourselves. It is expecting ourselves to be everything except human. But we are human, and we aren't perfect. Eating cookies and pizza and too much happens. Regret and negativity will only lead to a loss in confidence. And you what feeds the cycle? Feeling like we should be punished for it. You can break the cycle and just enjoy your time over the next two weeks (heck, forever!). 1. Why are you having the thought in the first place? Often, our regret comes from some unspoke rule or restriction we have placed with ourselves. Explore if something deeper is going on. Maybe you recognize that you are feeling anxious about all of the sweets you will be around for the next three days that you promised yourself you would only have one today. See what comes up for you. 2. Consider how the food tasted. Was it delicious? Was it not all that good and you're unsure why you ate it. Just reflect - no judgement. 3. Think about how it made you feel. Did you feel sick? Did you feel content and happy? Did you feel good at first, but then kept eating and it led to feeling sick? Again, just think about this. 4. Let it go. You have increased your self-awareness, now it is time to put the situation behind you. Continuing to mull over it will impact your next eating event (and not in a good way). Remember - you are human. 5. Let go of your self-control and any attempts at 'making up' for what you ate. No new diets, no fasting, no extra hard work in the gym. Just let it be. Trying to make up for it will only perpetuate the cycle and likely lead you down the same path the next time you are at an event. Remember - all foods are allowed. Following the above steps can help bring you closer to the place where you have body awareness and mindfulness in the moment of an eating event.What eating event have you been beating yourself up about? Are you ready to let go of the regret? Older Postself-control: is it necessary?